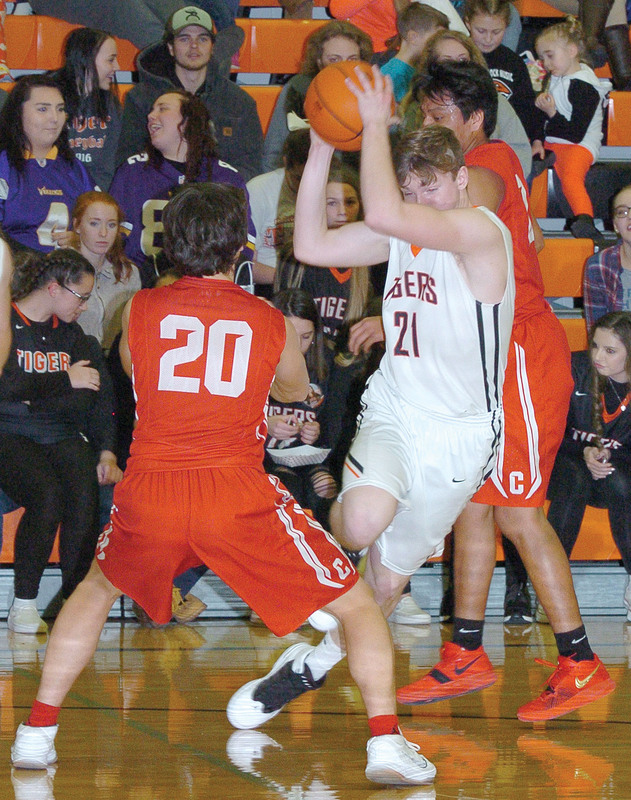 The Tigers clicked on all cylinders Friday night at Mobridge-Pollock High School Gymnasium in a 62-45 win over Chamberlain. The Tigers had big scoring runs in each of the first three quarters. After Chamberlain took a 5-1 lead early in the first quarter, the Tigers took the game over with an 18-2 run. Braxton Albers hit a three to get the Tigers started. Bryston Goehring took over from there scoring 11 points. His fourth basket of the run came on a steal and layup that give the Tigers a 19-7 lead. They kept things going, starting the second quarter with an 11-2 run. Braden Goehring started the quarter with a three-pointer and ended the run with two free throws to give the Tigers a 30-11 lead. Leading 37-21 midway through the third quarter, the Tigers scored 12 straight points to take a 49-21 lead and put the game away. Braden Goehring scored six straight points on a three and three-point play, followed by three-point bombs by Caden Halsey and Albers. A mini run of five points to start the fourth quarter gave the Tigers a 30-point, 56-26 lead, which meant the clock would run continuously until Chamberlain cut the lead to 19 with just one minute left on the clock. Knudson added that it was not just the offense, it was also the team’s play on the defensive end that created the scoring opportunities. The Tigers scored points across the board. Albers finished with a game-high 14 points, while the Goehring brothers scored 13 points each. Noah Feyereisen and Halsey did their parts, combining for 15 points and 10 rebounds. Knudson credited one player who did not account for many points as having a huge impact on the game. He said Trace Cerney provided a ton of energy for the team with this defensive play and hustle. Louie Running Horse and Zach Toering led Chamberlain with 10 points each. Drayton Priebe and Brant Gullickson added six points each. The Tigers take on the Todd County Falcons in the second game of a doubleheader at Mobridge-Pollock High School Gymnasium on Saturday. With no junior varsity games, the Lady Tigers and Lady Falcons will start the proceedings at 2 p.m. The Tigers and Falcons will be playing for the 44th time. The Tigers lead the series 26-17 and have won five of the last six contests, but the Falcons beat the Tigers 72-67 in Mission last season. Chamberlain: Drayton Priebe 2 1-2 6, Marty Ross 0 0-0 0, Brant Gullickson 3 0-0 6, Louie Running Horse 5 0-0 10, Cameron Caldwell 3 0-0 6, Hayden Evans 2 0-0 5, Zach Toering 4 0-0 10, Sellyck McManus 1 0-0 2, Totals 20 1-2 45. Mobridge-Pollock: Noah Fried 0 0-1 0, Noah Feyereisen 3 2-7 8, Braxton Albers 5 1-1 14, Trace Cerney 1 0-0 2, Bryston Goehring 5 2-2 13, Braden Goehring 3 5-5 13, Caden Halsey 3 0-1 7, Cayden Eisemann 2 0-0 5, Totals 22 10-17 62. 3-point field goals: Chamberlain 4 (Toering 2, Priebe, Evans); Mobridge-Pollock 8 (Albers 3, Braden Goehring 2, Bryston Goehring, Halsey, Eisemann). Rebounds: Chamberlain 18 (Running Horse 6, Toering 4); Mobridge-Pollock 24 (Feyereisen 5, Cerney 5, Halsey 5). Steals: Chamberlain 1; Mobridge-Pollock 5 (Bryston Goehring 2). Fouls: Chamberlain 17; Mobridge-Pollock 10. Turnovers: Chamberlain 12; Mobridge-Pollock 9.